Practicing jazz guitar licks is a very important aspect of jazz learning. Particularly when these licks are transcribed from improvisations of the greatest jazz musicians of all times (Cannonball Adderley, Barney Kessel, Sonny Rollins, Charlie Christian, Emily Remler, George Benson, Grant Green, Herb Ellis, Jim Hall, Jimmy Raney, Joe Pass, John Scofield, Kenny Burrell, Charlie Parker, Mike Stern and Wes Montgomery) who helped forge the history of jazz music. 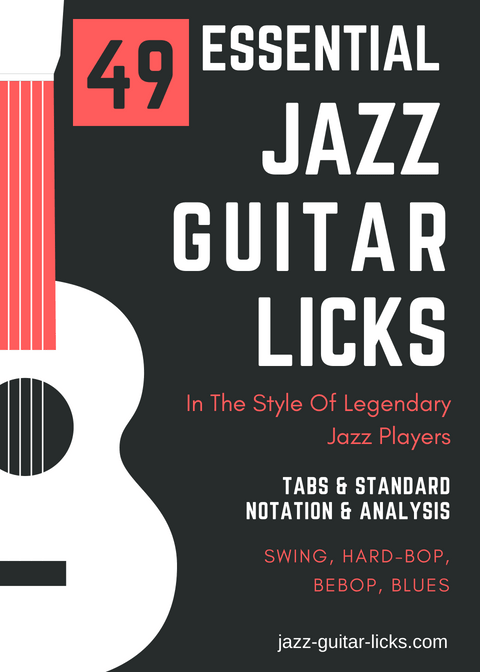 This eBook available for download in a PDF format contains 49 effective jazz guitar phrases and patterns with TABS and notation applied to common jazz chord progressions . These patterns both for guitar teachers and students cover different styles from swing to blues, to hard-bop to bebop. These essential jazz lines arranged for jazz guitarists from beginner to advanced come with easy-to-understand explanations of one of the greatest players improvisational techniques. Learning these jazz transcriptions make it possible to understand the approach of the great names of jazz to different chord progressions found in many standards as turnarounds, minor and major II-V-I, blues progressions, modal playing.